I recently spent the better part of a year and a half researching and writing a book documenting the history of the 1922 U.S. Supreme Court case of Federal Baseball Club of Baltimore v. National League, the litigation that gave rise to baseball's antitrust exemption. 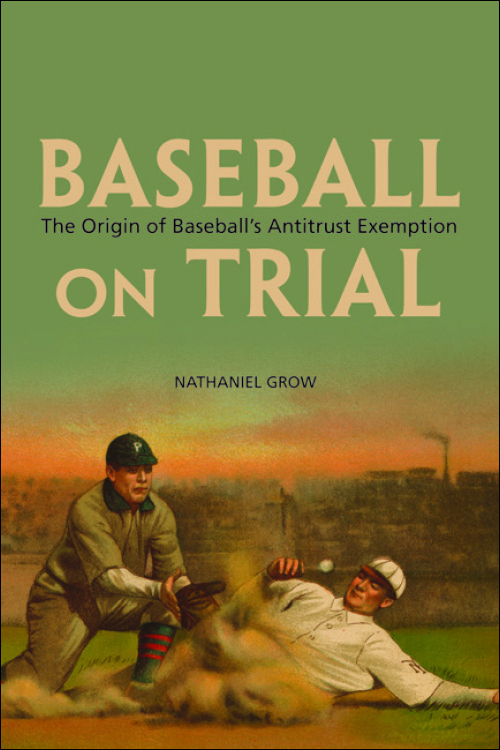 I am happy to announce that the book, titled Baseball on Trial: The Origin of Baseball's Antitrust Exemption (from the University of Illinois Press), has been released and is now available for purchase. Baseball on Trial draws upon a variety of original source materials, including the original court records from the litigation, contemporaneous newspaper accounts, and a recently released collection of attorney correspondence from the case available at the National Baseball Hall of Fame Research Library in Cooperstown, New York. Not only does the book document the history of the Federal Baseball lawsuit itself, but it also covers the many precursor cases arising out of the Federal League challenge to Major League Baseball in 1914 and 1915, litigation which in many ways set the stage for the Supreme Court proceedings. Through a series of posts over the next several days, I'll be summarizing some of the more interesting findings from my research. The controversial 1922 Federal Baseball Supreme Court ruling held that the "business of base ball" was not subject to the Sherman Antitrust Act because it did not constitute interstate commerce. In Baseball on Trial, legal scholar Nathaniel Grow defies conventional wisdom to explain why the unanimous Supreme Court opinion authored by Justice Oliver Wendell Holmes, which gave rise to Major League Baseball's exemption from antitrust law, was correct given the circumstances of the time. Currently a billion dollar enterprise, professional baseball teams crisscross the country while the games are broadcast via radio, television, and internet coast to coast. The sheer scope of this activity would seem to embody the phrase "interstate commerce." Yet baseball is the only professional sport--indeed the sole industry--in the United States that currently benefits from a judicially constructed antitrust immunity. How could this be? Using recently released documents from the National Baseball Hall of Fame, Grow analyzes how the Supreme Court reached this seemingly peculiar result by tracing the Federal Baseball litigation from its roots in 1914 to its resolution in 1922, in the process uncovering significant new details about the proceedings. Grow observes that while interstate commerce was measured at the time by the exchange of tangible goods, baseball teams in the 1910s merely provided live entertainment to their fans, while radio was a fledgling technology that had little impact on the sport. The book ultimately concludes that, despite the frequent criticism of the opinion, the Supreme Court's decision was consistent with the conditions and legal climate of the early twentieth century.